This week's soup comes from the current issue of Vegetarian Times magazine which always has really delicious recipes. (In fact I have about 8 tabbed in this issue already). The Shaved Fennel in Lemon Broth comes from an article called "Soup in the Raw," about soups you don't have to cook and can just whip up in the blender. Simple, light and pretty healthy, I used some locally grown fennel from the market and green onions from my CSA box to make it. I served this light, lemony soup with the Grilled Brie and Tomato on Crusty Bread that I posted for Tyler Florence Fridays. Vegetarian Times says: "Fresh fennel has a delicate crunch and a mild lemon-anise flavor that's perfect in cold summer soups. Shaving fennel into paper-thin strips is a snap with a mandoline, but you can also do it with a knife. Simply quarter the fennel bulb, then cut each quarter into thin slices. Enjoy this soup on it's own, or with sprouted or cooked wild rice stirred in for a heartier dish." Blend oil, lemon juice, garlic and three cups of water in a blender until smooth and no large droplets of olive oil remain. Season with salt and pepper, if desired. Divide soup among 4 serving bowls. Top each serving with 1/4 cup shaved fennel and 1 1/2 tsp green onion. Raw Soup Tips from VT: "Opt for sea salt when seasoning raw dishes. It has a relatively mild, slightly mineral flavor. Use filtered water in these blended soups so that the pure flavors of the ingredients can shine through." Notes/Results: Simple, light and flavorful, this is a nice soup for a starter. The fennel flavor really comes through as does the lemon. Since the soup is raw and made with just a few ingredients, it is important to use the freshest, best ingredients you have, including really good olive oil. You'll want to serve it immediately, or put it back in the blender right before serving (before adding garnishes of course), as the oil separates a bit as it sits. Being a fan of both fennel and lemon, I would make this again, maybe cutting down slightly on the olive oil and adding a bit more lemon for my tastes. Let's see who is in the Souper Sunday kitchen this week. It's been really hot in Northern Germany this week and Ulrike from Küchenlatein says you don't want to eat anything that heats you up so she and her husband have been enjoying the Cherry Soup from their childhood. 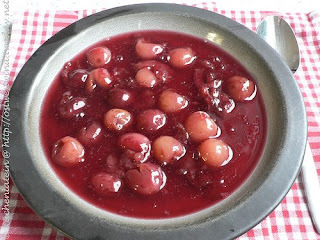 Full of sweet, delicious cherries and thickened with tapioca pearls, Ulrike says that the soup "can be enjoyed plain, with semolina dumplings or French vanilla ice cream." We have a new face at Souper Sundays this week, Petra aka FoodFreak, from FoodFreak, hailing from Hamburg, Germany. 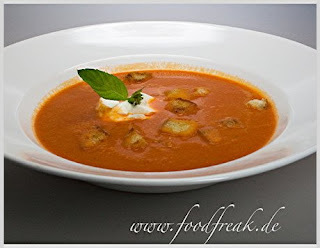 Finding two perfect red bell peppers in her weekly organic vegetable delivery, she knew she had to make a soup and created a thick and yummy Cream of Bell Pepper Soup with Ciabatta Croutons. Although she used homemade chicken stock, Petra notes that by using vegetable broth, "you could of course turn this into a lovely vegetarian first course." Welcome FoodFreak! 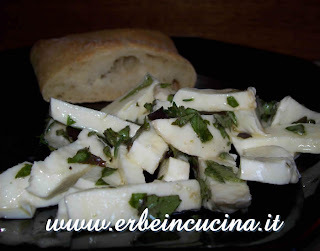 Graziana from Erbe in Cucina (Cooking with Herbs) is back this week with a fresh and lovely Mozzarella Salad with Herbs adapted from a recipe from Kalyn of Kalyn's Kitchen. Making the most of her herb garden, Graziana used wild thyme, golden sage, holy basil and Thai basil in her version. Cool, green and herbal, it is a perfect summer salad and side dish. Chrystal & Amir, from The Duo Dishes created an entire tea-themed grill meal for last week's Foodbuzz 24, 24, 24 program and wanted to share one of the favorite dishes, their Min-tea Watermelon Cantaloupe Salad. 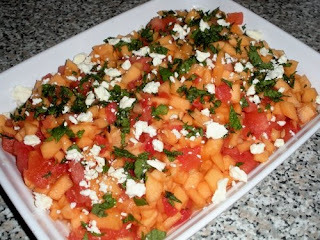 With melon marinated in peppermint tea paired with feta cheese, this isn't your normal fruit salad. The Duo says, "We actually drank the minty watermelon cantaloupe juice over ice. That’s how bright and refreshing it was to the taste." A cookbook win of a Rachel Ray cookbook, had Heather of girlichef inspired to recreate one of her favorite but seldom indulged in sandwiches, the Monte Cristo. Heather adapted Rachel's Super Stuffed Monte Cristo Sandwiches a bit to fit her "rules". Says Heather, "It's just not a Monte Cristo to me if there's no raspberry preserves!!!" It looks pretty tasty that way to me! L.K. from Healthy. Delicious. 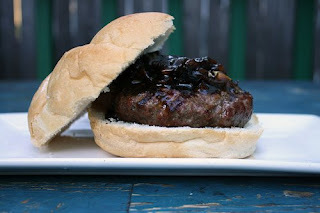 got busy preparing for her July 4th weekend by making a delicious, juicy burger, her Roquefurt Burger with Onion Jam. Indulging a bit for the holiday, she still kept on the healthier track by using a lean ground beef. L.K. says, "Since you’re stuffing the burger with cheese, you can get away with using meat that’s a little leaner than you normally would for a burger. The cheese melts inside and keeps it from drying out." Natashya at Living in the Kitchen with Puppies made the most of the fresh, homemade ciabatta she made this week and turned it into these gorgeous Grilled Eggplant Parmesan Sandwiches. 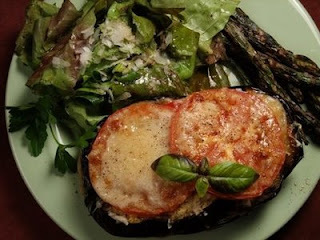 Natashya says these are "a healthier version of the original eggplant Parmesan, perfect for summer." Especially when served with fresh greens with Caesar dressing and grilled asparagus--yum! A very delicious and creative group of soups, salads and sandwiches and lots of great ideas for summer. Thanks to everyone who participated this week. If you have a soup, salad or sandwich you would like to share, come join us. You can get all the details for Souper (Soup, Salad & Sammie) Sundays by clicking on the Souper Sundays logo on the side bar. I love how there is no cooking involved, perfect for summer! I really admire your raw dishes, and this soup looks really cooling and tasty. Loving the lemon broth and shaved fennel soup - how delightful that must be! I can't wait to try it! I'm sure the fennel in the soup was really delicious, adding that extra kick. All of the Souper entries look great! What a wonderful round-up. I'll wager your soup is just delicious. Shaved fennel soup! So bright and summery. The soup sounds wonderful! So fresh and light for hot weather. And a delicious round-up! Your soup sounds absolutely terrific .. so refreshing and light.. love the round up this week. I used to make a shaved fennel and lemon salad, I loved it! I noticed that you just finished reading Trail of Crumbs. What did you think? I didn't care too much for it, all the whining and complaining, and the hateful ways she talked about her adoptive parents.